Shiloh is located 8 mi. [13 km.] north of Bethel, but south of Lebonah on the road that leads to from Bethel to Shechem (Judges 21:19). This religious center is where some of tribal allotments were made, the tabernacle was set up, and where Eli and Samuel ministered. It is mentioned 32 times in scripture, mainly in Joshua, Judges and 1 Samuel, but it also figures prominently in the sermons of Jeremiah (7:12, 14; 26:6, 9). It is well identified with Khirbet Seilun (177162) and has been excavated by a number of expeditions-especially by Israel Finkelstein from 1981-1984. It is currently (2012) again being excavated. Finkelstein, Israel. 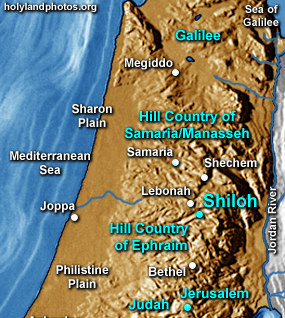 “Shiloh Yields Some, But Not All, of Its Secrets.”Biblical Archaeology Review 12, no. 1 (January/February, 1986): 22–41. To view the Basilica Church found south of the tell of Shiloh Click Here. To view the Weli/Church found at Shiloh (Jame Yetim; "the mosque of the orphans) Click Here. To view the "Shiloh Divine Presence" Click Here.